← Joe The Plumber, WTF is the REAL Deal With Global Warming? The implications to humanity and our societies from record-breaking Arctic warming continues to be underestimated by scientists, the media, governments and the public. Collectively, we are ignorant, brain-dead zombies, lurching into disaster. Arctic sea-floor methane emissions continue to rise in increasing amounts. I tell this story of Arctic Ocean methane sources and examine the risks of catastrophic methane clathrate bombs in the near future. Reference: ‘Effects of climate change on methane emissions from seafloor sediments in the Arctic Ocean: A review‘. ‘Abstract: Large quantities of methane are stored in hydrates and permafrost within shallow marine sediments in the Arctic Ocean. These reservoirs are highly sensitive to climate warming, but the fate of methane released from sediments is uncertain. Here, we review the principal physical and biogeochemical processes that regulate methane fluxes across the seabed, the fate of this methane in the water column, and potential for its release to the atmosphere. ‘We find that, at present, fluxes of dissolved methane are significantly moderated by anaerobic and aerobic oxidation of methane. 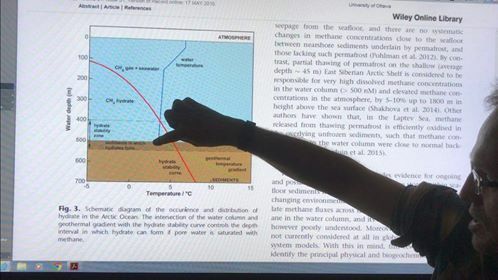 If methane fluxes increase then a greater proportion of methane will be transported by advection or in the gas phase, which reduces the efficiency of the methanotrophic sink.’ Full article continues at above link. In Greek mythology, Thanatos /ˈθænətɒs/(Greek: Θάνατος [Ancient Greek: [tʰánatos]] “Death”, from θνῄσκω thnēskō “to die, be dying” was the personification of death. He was a minor figure in Greek mythology, often referred to, but rarely appearing in person. His name is transliterated in Latin as Thanatus, but his equivalent in Roman mythology is Mors or Letum, and he is sometimes identified erroneously with Orcus (Orcus himself had a Greek equivalent in the form of Horkos, God of the Oath). ‘In his 1920 book Beyond the Pleasure Principle, Sigmund Freud applied the concept of Eros to psychoanalysis. He referred to Eros as the life instinct, which include sexual instincts, the drive to live, and basic instinctual impulses such as thirst and hunger. Its counterpart is Thanatos, which is the death instinct‘. This entry was posted in New Video, Videos and tagged Methane. Bookmark the permalink.